What are some of the things we can do to bring pleasure to God? There are many ways, but let’s just consider a few. Hebrews 11:6 declares that “without faith it is impossible to please Him.” Abraham is a great Old Testament example of this. In Hebrews 11:8 it tells us, “By faith Abraham obeyed when he was called to go . . . and he went out not knowing where he was going.” When we step out in faith and obedience to the word of God, it brings pleasure to the Father. It is as if He looks down at us and says, “That’s my child, see that? There he (or she) is, stepping out in faith and obedience according to my word. I’m pleased with him (or her). When David brought up the ark to Jerusalem he worshipped the Lord with all his might, and today God is restoring the tabernacle of David to the church (Acts 15:16). So we worship, not just because it makes us feel good, or even to usher in His presence (which we should seek), but to give pleasure to God (John 4:23-24). We have not looked at what displeases God or what brings Him no pleasure at all. (That’s another subject on its own.) But let’s just consider two verses in relation to the Holy Spirit that bring two challenges to us. 1 Thessalonians 5:19 tells us not to quench the Holy Spirit. To quench is the idea of dampening the flame of the Holy Spirit; it’s like pouring water on a fire. Ephesians 4:30 says do not grieve the Holy Spirit. Here the word grieve means to cause distress because of disobedience and sin. On the other hand, when we open up our hearts to allow the Holy Spirit full reign in our lives, I believe we bring not only power and purpose to our lives, but we bring pleasure to God. Just think of that – sharing in the joy that God has in seeing his servants fulfill what they were called to do. As we fulfill our destiny in God, we will be able to say as Paul did in Acts 26:19, “I was not disobedient to the heavenly vision” (i.e. the call God placed on his life). When you spend enough time with a person, they become your friend. Moses was a friend of God and a great intercessor (Exodus 33:11). Jesus also told us that we could be His friends, too, if we obey Him. Let’s go back to the first thought we shared in the quote from Eric Liddell: “When I run I feel His pleasure.” After Liddell (the Olympic champion) died in a prisoner of war camp in China where he was serving as a missionary, a service was held in Glascow, Scotland, the land where he grew up. 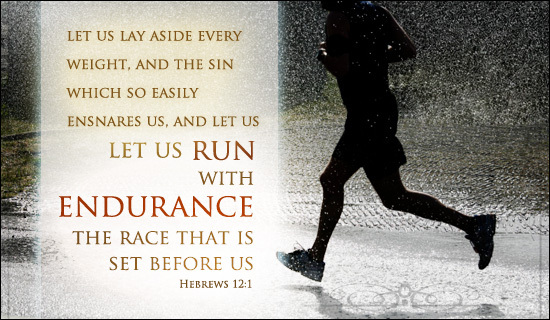 They read the words of Hebrews 12:1-2, which challenges us to “run the race set before us.” When we do, I believe we bring pleasure to God and receive a “well done” from the Lord. So, let us run to bring pleasure to our Lord.